From fast print speeds in vivid color to robust security, the HP Color LaserJet Pro M452nw will keep up with your active office. Because this HP color laser printer uses real-time threat detection, you can be confident in the security of your prints. Conserve energy while you work, and use built-in Ethernet and wireless capabilities to stay connected. 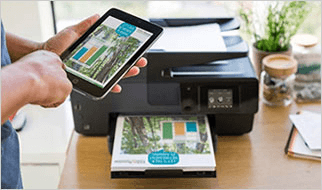 Use the HP Smart app for on the go printing, or use wireless direct to connect straight to your printer without accessing the local network. FAST PRINTING, SOLID PROTECTION – Fast printing and security built for the way you work—this HP color laser printer finishes jobs fast and delivers robust security to guard against threats. PRINT WIRELESSLY—NO NETWORK NEEDED – Count on wireless direct printing in the office from mobile devices, without accessing the company network. LEGENDARY HP QUALITY – This wireless HP color laser printer comes with laser technology, produces up to 600 x 600 dots per inch (dpi) standard, and is PANTONE calibrated. PERFECT FOR THE OFFICE – Get up to 28 pages per minute black or color and wireless printing. Recommended monthly volume of 750-4,000 pages. EMBEDDED SECURITY FOR GREATER PROTECTION – Keep printing safe from boot up to shutdown, with embedded features like real-time threat detection. WIDE RANGE OF PAPER SUPPORT – This HP color wireless laser printer works with: Letter, legal, executive, Officio (8.5 x 13"), 3 x 5", 4 x 6", 5 x 8"; envelopes (No 10, Monarch). EASILY CONTROL YOUR LASER PRINTER – Manage tasks with the 2-line LCD screen, buttons, and LED indicator lights—plus, this HP color laser printer wakes up to print faster than the competition. MORE PAGES, PERFORMANCE, PROTECTION – Bring out the best in your HP color laser printer. Get reliable performance and outstanding quality using Original HP Toner cartridges with JetIntelligence. ORIGINAL HP TONER: This HP color wireless laser printer uses Original HP 410A/410X black, cyan, magenta, and yellow toner cartridges. WHAT'S IN THE BOX – CF388A HP Color LaserJet Pro M452nw; 4 preinstalled introductory HP 410A LaserJet Toner cartridges; Getting Started Guide; Install Poster; Software CD; Power cord; USB cable. ECO-CONCIOUS CHOICE — has one or more meaningful eco attributes or eco-labels. ENERGY STAR® certified — meets federal guidelines for energy efficiency. Blue Angel and EPEAT Silver certified. Shift your office into high gear with a powerful color printer that doesn’t keep you waiting. Print your first page faster than the competition,1 and help keep your device, data, and documents safe—from boot up to shutdown. Keep your business nimble when needs shift or opportunity strikes—in the office or on the go.3 Print wirelessly with or without accessing the network.4 5 Stay connected with Ethernet and easily work from right where you are. Dutchchic: needed to updated and this one did it all for me - good price - nice features and love the air print! 1 Based on HP internal testing of top three leading competitors’ first page out from Sleep mode and duplex print speed completed 8/2015. Subject to device settings. Actual results may vary. For details see http://www.hp.com/go/Ljclaims. Automatic two-sided printing is not available for the HP Color LaserJet Pro M452nw. 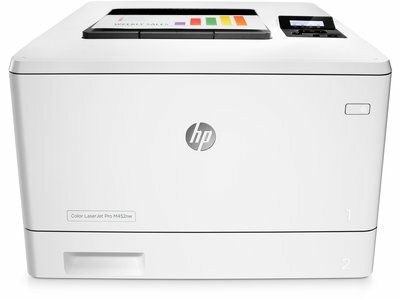 5 Feature is only supported by the HP Color LaserJet Pro M452nw and M452dw. Wireless performance is dependent on physical environment and distance from access point, and may be limited during active VPN connections.